“Washington Crossing the Delaware” by Emanuel Leutze, is an iconic image of the American Revolution. The weather depicted in the painting, however, may not be accurate. A new version of this celebrated subject by artist Mort Künstler explores some of these inaccuracies. Through the research of historical documents, Künstler learned that the actual crossing took place under the cover night and in the midst of a nor’easter. The artist also learned that the troops and equipment were probably transported on flat-bottomed ferries attached to cables that helped stabilize them in the storm. Depicted in more realistic conditions, the painting’s main subject is still a determined George Washington. However, it shows the general in the pragmatic posture of holding on to a cannon as he braces himself against the elements, which included strong winds, snow, and freezing rain. Leutze created his better-known image in 1851, seventy-five years after the courageous events of December 1776. His painting is an artistic interpretation that emphasizes the heroic status of General Washington. 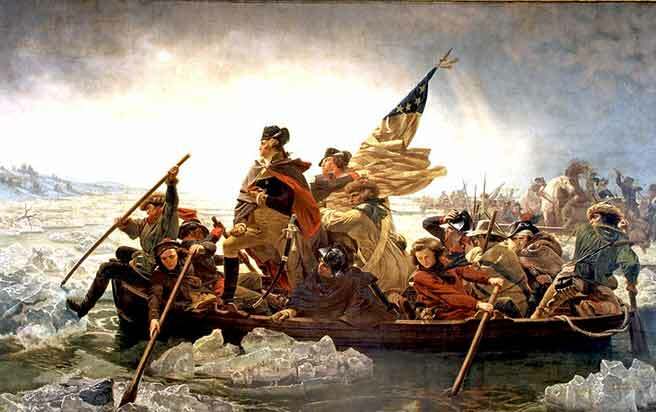 This is evident in the way he portrays the general illuminated by sunlight and standing tall in a rowboat as he crosses the icy Delaware River. The shape of the ice, in fact, is another questionable aspect of this classic painting. When frozen, the Delaware tends to form broad sheets of ice as opposed to the chunky crags that Leutze chose to illustrate. After four years of renovations to its American Wing, the Metropolitan Museum Art returned Leutze’s work to public display earlier this week. 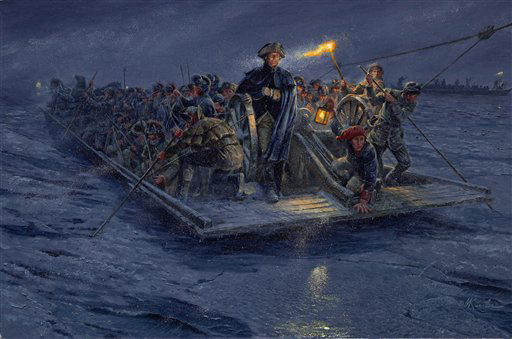 Künstler’s new painting entitled, “Washington’s Crossing: McKonkey’s Ferry, Dec. 26, 1776”, was unveiled at the New York Historical Society last month. Emanuel Leutze's 1851 "Washington Crossing the Delaware"
This entry was posted in weather and tagged arts, history, nyc by Melissa Fleming. Bookmark the permalink.